In 1988, Tammi Reiss capped her storied career at Eldred with a state championship. She is still the fifth leading scorer in New York State girls’ basketball history. 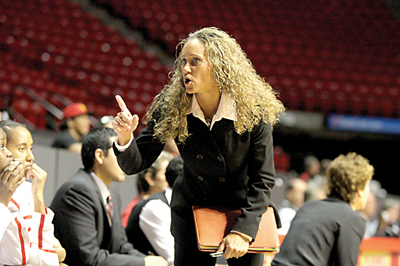 Now, she is an assistant coach for the San Diego State University women’s team. SULLIVAN COUNTY  Back in 1988, Tammi Reiss was a senior at Eldred Central School and one of the best girls’ basketball players in New York State. She led the Eldred Lady Yellowjackets to an undefeated record, the Western Sullivan League title, Section IX Class D championship, New York State Public High School Athletic Association (NYSPHSAA) Class D title and New York State Federation championship. Today, Reiss is a first-year assistant coach with the San Diego State University women’s basketball team. As of Wednesday night, the Aztecs had a 21-5 overall record this season and a 11-1 record in the Mountain West Conference (MWC). The team won the MWC title with a victory over Wyoming on Tuesday night and appears head to the NCAA tournament. In the 24 years between leading Eldred to a state title and helping guide the San Diego State Aztecs, Reiss has been extremely busy on and off the basketball court. She has played college and professional basketball, served as an assistant coach, pursued an acting career, been a personal trainer and opened businesses. “I have been able to achieve all of the goals and dreams I had for myself,” Reiss said in a recent telephone interview from her home in San Diego. Upon graduating from Eldred in 1988, Reiss had scored 2,871 points in her scholastic basketball career which began in eighth grade and continued through 12th grade. She was virtually unstoppable, combining quickness, ball handling and pin-point shooting into the ultimate offensive threat. Her high school point total is still fifth all-time among New York State girls’ basketball players. She appreciated the guidance and assistance of Coach Ken Bjorn and Assistant Coach Frank Kean, who also served as the head coach of the junior varsity team. Reiss also appreciated the work of Paul Tylawsky, who was the coach of the Eldred varsity boys’ basketball team but worked with her two or three hours a day. While basketball was clearly her best sport, Reiss also competed in cross country and track and field from seventh grade through 11th grade. As testament to her outstanding athletic talent, she won a state Class D cross country championship as an eighth-grader. Reiss earned an athletic scholarship to the University of Virginia where she played four years for the women’s basketball team. She started all four years playing both point guard and shooting guard. Her partner in the backcourt was Dawn Staley who went on to play professional basketball and for the U.S. Olympic team. Reiss finished her career at Virginia with 1,842 points which is second in school history. As a senior in 1992, she was named a Kodak All-American and an Academic All-American. While playing for the Cavaliers, the team reached the NCAA Division I Women’s Final Four three straight years  1990, 1991 and 1992. Unfortunately for Reiss and her teammates, they were unable to win an NCAA title in those three trips to the Final Four. Virginia was defeated in a semifinal game in 1990 and 1992. “Our best chance to win the title was in my junior year,” Reiss said. “We lost to Tennessee in overtime in the championship game. “It was a great accomplishment to get to the Final Four three times, but it was disappointing not to win a championship,” she added. After graduating with a Bachelor’s Degree in Sports Management in 1992, Reiss spent the next three years as an assistant coach for the Virginia women’s basketball team. Reiss returned to the basketball court in 1997 when the Women’s National Basketball Association (WNBA) was formed and she was selected fifth overall by the Utah Starzz. She played two seasons for the Starzz, averaging 7.2 points, 2.7 assists and 2.3 rebounds per game. A few years later, Reiss again had success as an actress, landing a role in the romantic comedy film “Juwanna Mann.” She appeared in many scenes and had several lines. The cast included Miguel A. Núnez Jr., Kevin Pollak, Vivica A. Fox and Lil’ Kim. In addition, several NBA and WNBA players had cameos in the film. In 2001 and 2002, Reiss was an assistant coach with the Utah Starzz. When the team moved to San Antonio, Texas in 2003 and became the Silver Stars, she served an assistant coach for one more season. For the next several years, Reiss moved away from basketball. She stayed in the Salt Lake City area and put her sports management degree to use. Reiss noted that sports management consists of two halves. One half is business, advertising and marketing. The other half includes exercise physiology and fitness. She opened a dance club called the Manhattan Club in Salt Lake City. After becoming a certified personal trainer, Reiss worked for Bally’s and was the director of personal fitness at a Gold’s Gym in Salt Lake. In addition, she served as the personal trainer for the wives of NBA players Karl Malone and Bryon Russell. Last year, Reiss heard about an opening for an assistant coach at San Diego State. The 41-year-old Reiss is enjoying her new job. “It’s been great,” she said. “I am very happy with this position. I spend a lot of my time working with the guards. I also spend a lot of time watching film of upcoming opponents and preparing scouting reports for our team. She also enjoys living in San Diego. In her spare time, which Reiss admitted she doesn’t have much of, she likes to spend time outdoors with her three Shih Tzu dogs. While Reiss is very happy to be an assistant coach at San Diego State, she does have other career aspirations. “I would love to be a head coach someday,” she said. With her work ethic and the experience she has gained as an assistant coach at the college and professional level, it is easy to believe Reiss will get a head coaching position in the future. And she wouldn’t mind if that position was closer to home. Her parents, Ed and Doretta Reiss, still live in her hometown of Glen Spey. Even though she now lives and works 3,000 miles away, Sullivan County will always have a special place in her heart. • 5th all-time scorer in New York State history (2,871 points). • Played in three consecutive Final Fours for University of Virginia (1990-1992) including championship game in 1991. • Finished as 2nd leading scorer in Virginia history. (She’s now 6th).